Ok. This has been one of the longest "serial posts" that I've ever done! So, this will be the last installment of the "Don't Resist-Persist!" series. I is for Insist on the Best! "Whatsoever thy hand findeth to do, do it with thy might;"
Whatever the task that the Lord sets before us we should give it 110%! God doesn't do anything half-way! Think about Salvation! Jesus had to be born of a virgin, live a sinless life, die on the cross, be buried, and rise again for our Salvation to be complete. It wasn't in Him to fail because He was 100% God and 100% man. Do our peanut brains comprehend this? Nope! But, we have to believe it.. That's where faith comes in! But, we do fail God-everyday. But, as a rule to live by, we should always strive to give God everything we've got for everything that we do. He gave His best for us! We can't have fellowship with the Lord if there's sin in our lives. We have to get daily cleansing because of our human natures. Here's some honesty for you. Recently we had to close our Christian school-the Lord closed the door. And I've been mad at Him about it since. Until yesterday. I know that God had His reasons, but the way I saw it was that He took my ministry from me. I miss the kids. And even though a lot of people helped with the school, and I was thankful for it, no one put as much labor and love into it than I did. I had even gone back to college just for the school-to make it easier for our school to be accredited! And now I'm unemployed! Yesterday, I realized that I needed God's help and fellowship more than I needed to be mad at Him. So, I asked the Lord to forgive me for my sin of anger towards him, and to please help me to focus on what I do have. I am saved; I have a wonderful husband, children, and family. 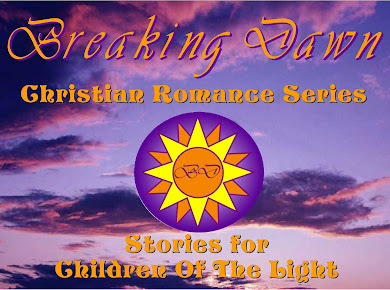 I have a GREAT Christian Romance Ministry (don't you think ! :) ) and I'm really excited about where is going to take that! I'm continuing with the college classes, because the deadline has passed to drop and I can't afford to pay back the grants! And Teacher Certification never hurt anyone, right? So, don't forget to take the time to be alone with the Lord everyday! It's important! T is for Thank others for helping you! "For none of us liveth to himself, and no man dieth to himself." I am so guilty of this-thinking that my life is a one-woman-show! I try to tackle everything by myself. But, I've learned that I can't do it all by myself-and if you're honest with yourself, you'll find that you can do it all either! So, take a moment either by phone call, email, text, tweet or post to thank someone for something that they've done for you. Especially if it's praying for you-that's the most powerful thing that anyone can do for you. My sister Marcie has been sick for the past two weeks, and when I spoke to the on the phone a few days ago, she said that she'd been praying for me and my family through this time of trial. I felt so ashamed, because I hadn't taken as much as a minute to stop and pray for others because I was too busy pouting about my situation. I love her dearly, and I thank her from the bottom of my heart for praying for me. Yesterday after the morning service at church, I was still out of sorts with the Lord, and had spent most of Sunday School still taking down the decor from the walls of my classroom (our church building has been pulling double duty as the school also for the past two years). Anyways, my brother Gary just about tackled me and told me to put my stuff down, and he grabbed me in a hug that I really needed. I cried and cried. He knew that I was still heartbroken. He told me how proud he was of me, and that everything was going to be alright. You just can't put a price on that. Thank you, Gary-I love you! And thank you, God, for sending them my way! Thank others for helping you-And Thank God for sending them your way! Have a great week, and pray that I can get back to my writing soon-maybe as part of my homework!